We are now Junior European Coed Group Stunt CHAMPIONS!!! The 5 of them travelled to Norway and worked their butts off, and came home with the 1st place trophy!!! They had to achieve so many points before recieveing their trophy which they did!!! 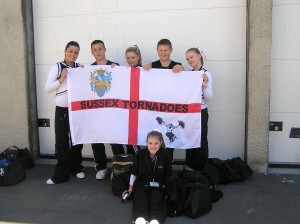 We are so proud of them going all that way for their County and us the Sussex Tornados!!! Robyn Kaines who competed at UKCA as their flyer also went with them, as she was too young to compete in Europe, but she helped win the 1st place in the UK. Junior Coed Group stunt arrived in Norway today, and have settled into their hotel, they are competing tomorrow and as soon as results are in they will be published here!!! Good Luck to each of them they are going to have a blast competing in Europe!!! Do Sussex Tornados Proud guys!!! 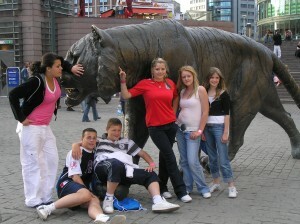 The Sussex Tornados Junior Coed Group Stunt are travelling to Norway to represent the UK. They competed at the UKCA nationals and Left CHAMPIONS! We also competed in Junior Coed Cheer and Again walked away CHAMPIONS!! The rules in europe are different to over here, and we can not compete in Norway unless everyone in the squad is over 12. In our Coed cheer routine we have 3 people under 12, and it was just not possible to replace all 3. 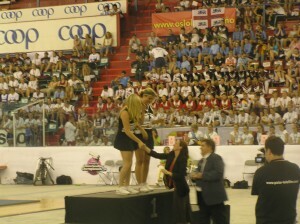 In their Coed Group Stunt we had only 1 person under 12, which we have replaced to compete in Norway. 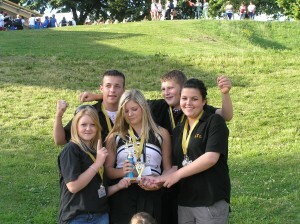 There is some pictures of the winning group below, and we will have pictures of the new flyer performing when we return. Our Original flyer Robyn kaines will be travelling to Norway with the others to cheer them on.